I quickly realized, however, that 'heading back to town' was much easier said than done. The long Gezirahan night was just settling in, and it now almost pitch-black. The narrow road meandered its muddy way up and down the steep, tree-covered slopes, under a sky that still dribbled cold splatters of rain. After only a couple of miles of hard vertical slogging, I vowed to never again look unkindly upon any Gezirahan-filled cart that happened to be going my way. As a last straw, it began to rain again in earnest, and Aahz finally agreed to stop for the night. We picked a squat, bushy tree beside the road under which to, for lack of any better phrase, set up camp. Aahz was able to scrounge up some dry wood from somewhere. I ignited the gnarled branches with a quick blast of magik, and set up a simple magik ward around us in the darkness. After we were hunkered down, performing the ritual poking of sticks into the fire, Brockhurst began producing a array of surprisingly bulky items from hidden pockets in his stylish outfit, some obviously weapons, some not. One of the last things he pulled out was a package wrapped in a highly reflective substance. He ripped off the wrapper, revealing a handful of knobby brown bars. He offered one to me and after a noticeable hesitation, one to Aahz. "What are these?" Aahz asked suspiciously, eyeing the brown shape in his claw like it was about lunge at his throat. "Oats." With a practiced bite, Brockhurst chomped off the end of his bar and began chewing vigorously. Aahz grunted, knowingly, but I stared at my bar feeling queasy. Brockhurst must have seen the look, as he shifted the mass to one cheek and amplified. "They're assassin guild survival rations. You never know when, while on an assignment and through no fault of your own," he glared over at Aahz "..you might end up stranded out in the woods without any dinner. 'Oats' stands for 'Official Assassin Travel Sustenance. They're made by the Vipers." "Vipers? What dimension are they from?" Aahz rolled his eyes and Brockhurst shook his head. "No. They're not from any dimension. They're a guild of assassins; the League of Crimson Vipers. You did know there's more than one assassin's guild, didn't you?" "Well, those Vipers. As you no doubt know, the Vipers' main specialty is untraceable poisons. What a lot of people don't know is that they sideline in all kinds of food production. Including OATS, which they sell at a discount to the other Guilds." Brockhurst leaned forward, obviously warming to his subject as he chewed. "Now, normally, you'd think that we wouldn't trust them not to poison us, right? And we wouldn't. But there's an interesting story behind that. You see, the Vipers and the Lonny Hill crowd got into this squabble over turf a couple hundred years ago, when there was this chain of restaurants owned by this politician.."
As he continued, I wondered vaguely if there was something in all assassins' training that provoked this tendency for lectures. Maybe Brockhurst and Tanda went to same school, although the possibility boggled the imagination... The Imp's voice faded into a drone in the background. At this point, my stomach woke up and began growling loudly; I realized with a start that we hadn't eaten since leaving the hotel. (How long ago was that? It already seemed like weeks..) Profoundly glad that Aahz hadn't been given time to 1) remember that I knew how to set animal snares, and 2) send me back out into the rain, I broke off a corner of my bar and cautiously popped it in my mouth. The bar didn't taste like much of anything, and you could chew it for what seemed like hours before it finally dissolved in your mouth. Aahz tasted his, silently curled up his lip, and offered what was left to me. I absently stashed it in my pocket as I looked over at Brockhurst, who was still talking..
"...he said, 'you vant your vindows vip....' Huh? Sorry. What?" "I know this may be a bad time to ask, but how were you able to disguise yourself back there? When you were working for Isstvan, we... uh... you got dosed by that magik-killing joke powder." Instead of becoming angry, Brockhurst sighed, and made a gesture at the various items scattered around him. "I used one of these. I've become a mechanic, a gadget-monger. After you paid me for the campaign against Big Julie's army, I got caught up on my guild fees, took the rest of my cut to the Bazaar and started buying whatever magikal backup I needed. I could afford it, so I got the best. Now, well, I get by. And in a hundred years, the powder wears off, and I'll be skilled in both areas. I suppose I should thank you, but I'm not going to." He smiled. I smiled back, trying to show as many teeth as he had. "The next time you're in the Bazaar, come on over to our headquarters and I'll introduce you to Massha." Aahz interrupted from the shadows on his side of the fire. "Save it. Something for you to look forward to with rapturous anticipation. And now that we've gotten Brockhurst's life history updated, can we maybe get some sleep?" As I tried to get comfortable on the hard ground, the OATS settled in my stomach like a lump of lead, and I thought about the Gezirahans back at camp, eating their slop and sleeping on their filthy mattresses. They didn't know how lucky they were. I dozed off, listening to the rain drip off the foliage. The next morning, after we'd uncramped ourselves, things looked a great deal better. The ward was undisturbed. The sun had come back out, and brightly-colored animals were flitting between the trees, chirping and whistling cheerfully. Every dimension seems to have some variant of this- these appeared, oddly enough, to be bats. We broke camp and washed off what layers of grime and fur we could in a stream that tumbled across the road. Aahz then rose and looked around himself in disgust. "Wonderful. No way to hitch a ride. This crummy goat-path sure isn't the route the logging wagons use. They must take the logs somewhere else to ship 'em off-dimension. Why can't these Deveels do something sensible for once, and ship the logs back to town for dimension transport?" "Um.. Aahz? What do you mean the logging wagons don't come this way? Didn't we come up this road in one?" "Kid, please. That was just a lousy cart for hauling the workers around in. A logging wagon... well, trust me on this. You'll know one when you see one." "But that Deveel at the hiring hall called it a wagon!" Brockhurst injected himself into the conversation. "Who cares what they're called! You say nothing's coming. So how do we get out of here? Fly? It's a two-day walk back to town." "Well, I can fly, but I don't think I can carry..."
Aahz silenced us both with a glare. He then gave a mirthless grin. "We walk. And the first thing with wheels that we see going in the right direction, we hitch a ride." I almost asked him what would happen if the owner of the wheeled object took exception to this little plan, but decided I probably wouldn't like the answer and held my tongue. We glumly clumped along single-file up and down the hills and between the endless rows of towering trees. The road remained deserted. In front of me, Aahz would shoot an occasional murderous glance at the cheerful bats warbling overhead. Fortunately for them, there wasn't even a good rock to be had for throwing. Brockhurst walked silently behind me. Looking up at the ancient trunks towering around us, I suddenly felt very small, and very young. Whatever turned out to be happening here on Gezirah, they would probably still be here long after it was all over, and we were all forgotten. Unless Blox chopped them all down, of course. Some time later, we came down the last of a series of switch-backs and abruptly found ourselves at a confusing crossroads, with five or six roads of different sizes all running together. The remains of a rotted, useless, signpost sprouted amidst the muddy confusion. For a long time, Aahz stared in all directions and then sighed. He turned around. "I don't suppose either of you saw this last night?" "I was buried on the bottom of the pile the whole time. All I saw were rotten wooden slats." Brockhurst absently pulled out one last splinter as he spoke. Aahz sighed again. "I tried to keep track, in case something like this happened, but somehow I got distracted." He managed a somewhat feeble version of his grin, and continued. "OK, kid, you'd better levitate up above the trees and tell us if you can see a..." He broke off. "See a what?" Automatically I started casting around in the air for a force line. 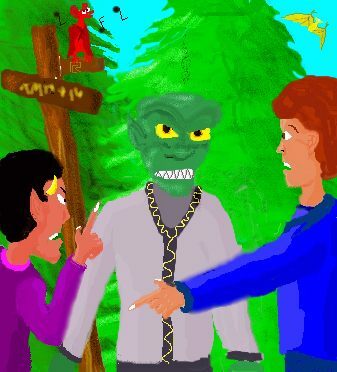 He raised a scaly green hand in a shushing gesture, his head cocked. "Something's coming. From that way." He pointed down one of the larger roads. Brockhurst listened intently, and tentatively nodded his head. "I think you're right." I still couldn't hear anything, but I had long ago accepted Aahz's unequaled ability as an early- warning system. "Glad to hear that those ears are good for something." Aahz plowed on, cutting off whatever retort Brockhurst had planned. "OK, we don't have long. Before they get here, slap some disguises on us. Cover Brockhurst, too. I don't trust gadgets and I never will." "Yeah, kid? Make it fast." "Last time I made us female Gezirahans. How do they... umm.. I mean.. what's the difference? So I can make us males?" "Oh! Right! That's easy. Female Gezirahans have those.." He broke off again, obviously struck by a sudden thought. He smiled evilly. "Never mind. I've got a better idea. Make us all Deveels instead. It's a logging wagon, and when it gets here, we're gonna play this from the other side of the tracks." "Another wagon." Brockhurst grumbled in disgust. I silently agreed, my resolution of the previous night suddenly evaporating in the warm sunlight. "Look, Imp. I said that that wasn't a logging wagon. Now shut up." I piped up, my earlier qualms resurfacing. "But what if they're headed away from town, instead of.."
I looked at him, and gave Brockhurst a resigned shrug. As the logging wagon came rumbling slowly into view, three somewhat bedraggled Deveels stood in the crossroads waiting for it.